Two days ago on 22 Sep 11 (interesting date 11+11 Sep 11) scientists at CERN (see 666) announced that they have broken the speed of light. Antonio Ereditato, spokesman for the international group of researchers, said that measurements taken over three years showed neutrinos pumped from CERN near Geneva to Gran Sasso in Italy had arrived 60 nanoseconds quicker than light would have done. If confirmed, the discovery would undermine Albert Einstein’s theory of relativity, which says that the speed of light is a “cosmic constant” and that nothing in the universe can travel faster. This is game changing because it alters the way scientists must think about the universe. If it is possible to exceed the speed of light then who knows what else might be possible? Fritjof Capra says: “The statue, symbolizing Shiva’s cosmic dance of creation and destruction, was given to CERN by the Indian government to celebrate the research center’s long association with India. In addition Rafael Tamargo, M.D. discovered that Michelangelo depicted brain anatomy in the neck of God in another Sistine chapel fresco. He published this finding in the journal Neuroscience (May 2010). What is the archangel Michael [through Michelangelo] telling us? God is at the center of consciousness. The hemisphere within a hemisphere design at CERN reminds me of Arnaldo Pomodoro’s Sphere within Sphere sculptures in the Vatican, the UN HQ, and other strategic locations. The sphere within sphere also represents the hypersphere, or higher dimensional sphere. Are physicists bozos to be searching for this bozon? They have spent €7.5 billion (US$15 billion) trying to look into the mind of God. And scientists are the people least likely to believe in God even if they see evidence of him/her. I stretched a cord (shown in green above) from the center of the smaller ring at CERN and you’ll be amazed where it leads. Inspired by a post the brilliant Bert Janssen did back in 2008 I found something slightly different and perhaps even more interesting. The next stop on this green line is the center of the historical core of Paris. The green line goes right through the center point of solar alignments I discussed in my Paris Part 1 video. Just to give you some perspective, the green line originating at CERN is essentially parallel to the Eiffel Tower axis (white). The red line is the azimuth of summer solstice sunrise, the blue line is the obelisk marking winter solstice sunset, the yellow line marks equinoctial sunset, and the cyan line is due south to the Gates of Hell and entrance of the Paris catacombs. The white axis makes a beeline to Danebury hill fort in the UK as mentioned in The Snowflake and the Flower, but I digress. The final stop on the green line is the Cherhill obelisk sitting on top of Oldbury hill fort in the UK. This green alignment is absolutely precise. The distance from the center of the CERN ring to the Cherhill obelisk is exactly 443.00 nautical miles. If you allow a one unit grace (as is done in gematria) the distance resonates with 444. The London Eye is 444′ high. The prophetic book Two-Thirds: A History of Our Galaxy by David Myers is one of the most amazing books I’ve ever read. The back cover says: “Two-Thirds is the key to understanding our history, and is, in fact, non-fiction.” It appears to be fiction but there is too much brilliance in the book for me to believe it is merely a flight of fancy. It seems to me to be channeled from a higher intelligence. For example, Figure 111.1 in Two-Thirds depicts Oldbury and the Cherhill obelisk. It says the Cherhill obelisk represents the soul’s position within the brain, slightly to the right of the center. The Oldbury earthworks represents the two hemispheres of the brain. “Solar system light speed is approximately 186,000 miles per second and extends well beyond the limits of the solar system. Interstellar light speed is the speed of light between solar systems. Over 400,000 times faster than solar system light speed, interstellar light speed begins well beyond the limits of a solar system and extends well beyond the fringes of galaxies. Myers says the white horse is a symbol of the center of the galaxy. I find that intriguing and I’ve always remembered it. There is a white horse in the heavens, known as the Monoceros constellation. Its single horn points directly at the silver gate (see my Esoteric Astronomy video). The crossing of the milky way (blue line) and the ecliptic (red arc) happens at two points that the ancient Egyptians called the silver and golden gates. The soul passes through the silver gate at birth and the golden gate at death and continues on its journey to the center of the galaxy. I find it particularly interesting that the Horsehead Nebula is designated Barnard 33. We are in the Orion Spur of the Milky Way galaxy. Spurs suggest horses do they not? The most famous white horse was of course Pegasus. Pegasus was sired by Poseidon and foaled by Medusa. In fact Pegasus is the god of horses, having created them out of waves. Poseidon’s trident reminds me of Shiva’s trident and the pair of tridents in the 9/11 Memorial museum pavilion (see Freedom Tower). Pegasus was sacred to the Muses. The following crop circle appeared at the base of Cherhill on 17 July 99. Its nine triangles remind one of the nine Muses. Incidentally I drew this crop circle and published it in my Crop Circle Coloring Book. Mnemosyne is the mythological mother of the Muses and personification of memory. The band MUSE makes some very interesting music and I enjoy listening to them, although I’m never really sure where they stand. MUSE is rife with Masonic, Illuminati, and mind control symbolism. Benjamin Singleton feels the same way; read his Duality of Muse post. 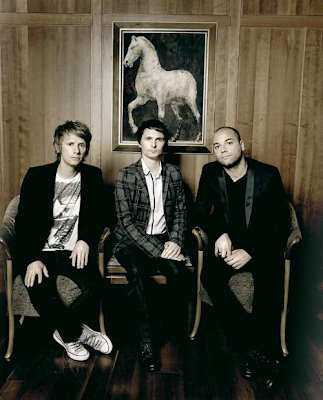 One picture that stands out are the band members of MUSE in front of a white horse. This is certainly not accidental and I’m sure you’ll agree if you read Benjamin’s post. If you recall my Foundation Stone post, the Cherhill obelisk is 33 degrees from the foundation stone at the center of the Dome of the Rock in Jerusalem, underlining its incredible significance. Many provocative connections here, that challenge the imagination and the memory’s capacity to keep it all together. I’m extremely greatful for your pointing out the silver and golden gates of the Ancient Egyptian sky. This is very important to me. I’ve suggested to Graham Hancock that the Duat exists on the horns of Taurus, as oppossed to the Gemini position that he has favoured for the Duat. This becomes relevant to me in my research on Buffalo-Niagara, connecting the Duat and the Da at (invisible 11th sephiroth) with Niagara which means “the Neck”. My spontaneous visionary experience in Tulum, in 2005, revealed through my mind’s eye, a biocosmic correlation between the ida and pingala, and Gemini the Twins. The twins appeared as two humans guarding a step pyramid in the “other world” which I vividly experienced. [I believe the kundalini serpent emerged from that pyramid] Later, the two forces seemingly appeared as two dolphins that guided me to the cosmic portal in the deep ocean rift, that opened on galactic center Xibalba be, imum coeli, and the Paradise Islands of the Pleiadies on the zenith. Whereas, I’ve been predicting speeds exceeding the speed of light for over 25 years (engaging with college professors about this intuitively self-evident phenomenon which they considered sacrilege)and I’m glad for the evidence at CERN. Maybe this is different from what you are talking about but was interesting to me just the same. It’s related Martin. 21 Dec 12 is known as Galactic Alignment. See my Esoteric Astronomy video. The Earth, Sun, and Galactic Center all align with the silver and golden gates at 11:11 universal time. Prepare for a major upgrade! just curious cuz heard you on red ice mentioning a crop circle coloring book….is it on this site?! @# is it for sale somewhere else?! sounds perfect for kiddohs!! Please note the burning Twin Towers in the A of W dome. I am aware too that the ‘stacks’ are most likely representative of the Merimac and/or the Minataur but the image is interseting nonetheless. This is an awesome digest. I’ve heard that CERN is being used to connect to and stabilize parallel realities where the the Nazi element has won. In tier 1 science the fibonicci sequence is widely known, the sacred geometry & the gates to hell and the gates open to heaven are both a reality. The event horizon for hell is high above & there are several. This has already been seen “in the spirit”, Beyond the five energetic dimensions are seven spiritual dimensions. As for the so called god particle….well, when you open a gate to the fallen, you invite great evil. Imagine the capability of the incredable hulk, and that’s what you allow into our dimension. Welcome to your nightmare. See steve Quayle on my blog, or google it.They get to 35 feet tall, but on earth, about 12 feet tall. Not your garden variety bigfoot the natives have traded with. The last one taken took two waves of attack, the first of which five men were killed and eaten. So, now you know what will be unleashed into the world. That ‘s what CERN is all about. Next issue is this 2012 stuff. You won’t see any difference from one day to the next. The only thing that obvious are waves of chemtrails to geoengineer earth into just like Mars. Low pop, high tech, and too rough to survive in wilderness outside of the dome. The pole shift is very survivable moving Canada 1,200 miles south to where the USA is, but with a tilt. This will take about 2 months. The real danger is the collapse of the magnitosphere, being in the daylight will mean death for about a month out of a period of five months or so of high UV risk. Survival will mean a min of 8 feet of dirt or 1 & 1/2 feet thick of concrete. This is minimum for xrays. All of these events are simply a repeat of the passover of the brown dwarf star Nemisis. Like the last passover when Hebrews left Egypt. On it’s hyper elyptical orbit The trajectory of Nemisis is on approach between the sun and Jupiter. As it approaches the sun it will increase speed by gravitational effect. This is solar cycle 24. Increased activity from the solar winds, Coronal mass ejections will cause volcanic erruption. There is a top of a volcano expected to slide into the pacific. This would bring a tsunami, where 80% of the population lives. This could produce a tsunami moving at 750 mph at a few hundred feet high. This could effect land up to 300 miles away depending on your elevation. So we have a convergence of cyclical celestial events. The pole shift in the 11,500 cycle, the procession of the equinox, the 350 year cycle for ice ages, and also the 105,000 year ice age cycle. On technologies. You can hand hold a weapon that can vaporize you at 11 million degrees. Shrivel a bus to the size of a VW volkswagon. The standard apeed of the TRB-3 is about 12 million mph moving from geosycnchronoue orbit 22,500 miles up to tree top in 5 seconds. Pilots of psi ability think the ship into a gravity well to multiples of superluminal speed. The communications is hyper dimensional meaning you can have no delay by hear the last words of Julius Ceasar as well. The moon is loaded with helium 3 for fuel. The mining personnell live in domes. One can even spot the glowing fusion reactor as shown by John Lear, since there is oxygen & plant life and lighter gravity. The Mars cities are ruins that wiped out when about 11,500 years ago, Jupiter and Venus were in alignment since one of these was being pulled into it’s new orbit. All conventional military weaponery and equipment have no defence against scalar energetics, except more of the same…. HAARP and the electronic cage can be applied for geoenergetics on nonliving systems, bioenergetics on living systems, and psycoenergetics or psycotronics, on mind and emotion. It’s capable of a variety of applications, like endothermic or exothermic reactions if you want to attack California, bring down a NASA ship, or attack Hati, or Japan. Or fear placed into you by the magnetic spin resonance that can cause it. Our friend Dutch S. will be a great source while the net is still relatively open, for tracking applications against the new madrid fault, with 150 million in the danger zones, but there’s also the gassas from hydrofracking to weaken the fault. The salt dome holding back the gulf ocean is deteriorating & primed for a tsunami if the volcanoe in the gulf doesn’t go up. Nuclear generating stations built in the danger zone are in the double digits. Expect a new port at Salt (Lake) City on the fifty mile wide river all the way to the great lakes. This will be also a spiritual judgement. This will happen because Obama brings false peace to the mid east as the false prophet. He will sign the two state solution in defiance of the will of God. This…is the time of Jacob’s trouble. The 1,260 days of judgement begins with the Obomanation, of desolation. So for all you who give heed to seducing spirits by communing with yopur ascended masters, get ready to discover you are part of the great falling away. The plagues revisit us folks….better get your peace made with God…you were never meant to go it alone. The pope is allowing sacrifice to demons on Friday nights beneath the Vatican. The throne of Satan has already been projected on stage for the public to view. The theory of relativity is a monumental hoax…yoy know…354 days to 1 G of constant acceleration and they will see it. Someday when superluminal ship takeoff→ will go beyond. Mass not increasing with velocity. Time not decreasing with velocity. Speed of light only is an ordinary velocity more. Gravity do not is a “curvature” of that called “space-time”, really it is a force like electromagnetic force…”space-time”=velocity-bacon. The “motor Warp” is another falsehood relativistic concept more, etc. Time put everyone in their place. …interstellar travel (Alpha Centauri C: 1g)… passengers climb in the space-elevator to the ship…awaits them in the asteroid Toutatis, which long ago placed in geostationary orbit… Day 1: zero-speed…distance = 40.68 Billion kms (4.068*10¹³)…total time travel = 1490 days (4 years and 1 month)… THE SHIP TAKEOFF►… 354 days to 1 G (9.8 mts/sec²) of CONSTANT ACCELERATION (weightlessness solved the problem), the ship with its powerful Antimatter rocket engines working tirelessly…antigravity fields generator run forwards working, and no collisions with anything…the ship reaches light-speed and…disappears…to enter into “superluminal dimension”… and still traveling at superluminal-speed > 1c… Day 745 (2 years and 15 days): the ship reaches the halfway…maximum superluminal-speed = 2.1c…”ladies and gentlemen please belts, for a few minutes while the motors are Off will be in weightlessness during the maneuver”…the ship rotates 180º around its “vertical” axis (perpendicular to the longitudinal axis of momentum)…On engines again and…◄starts to brake… Day 1136: the ship slows light-speed and…appears…descends again to the “subluminal dimension”… 354 days more decelerating and the ship is at zero-speed, the passenger disembarks at destination, a planet of Alpha Centauri C.